Beautiful cottage only 45 mins from barrie. Long lake is in beautiful bala. Our cottage blesses us with warm sun all day long on while sitting on the dock....And a lake that is perfect for canoeing, boating, tubing or just bird watching.....We have it all. The cottage has a top loft with a queen been and 2 single beds as well as a sofain the living room....Its paradise with just good times. 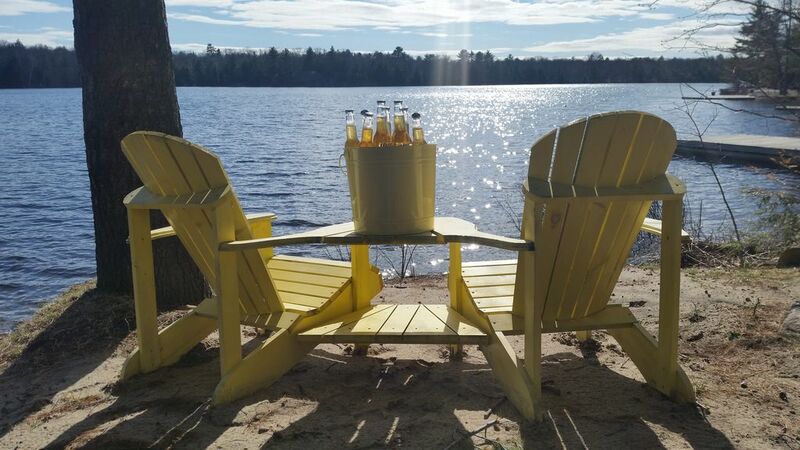 This cottage combines the relaxing world of cottage life on the lake with the convenience of having the town within reasonable walking distance with beer store, lcbo, a fresh mart grocery store and a hand full of restaurants and ice cream shops . The kee to bala is also a very well know concert hall and it opens on may 24 weekend. They hosted some very well-known artists last year such as snoop dog (not a misprint, I couldn't believe it either), kim mitchell, blue rodeo, sam roberts, etc. This was my little families first stay in Bala. The cottage although small was clean and quaint and had everything we could possible need (except AC for those hot nights) but that is me being "middle aged" brought and extra fan which helped a lot. The little cottage is very close to the larger cottage,with no privacy between but we had a great group of neighbors and to my 8 year olds delight had other kids she could play with which gave my husband and I some much needed quiet time. :) We spent days on the dock,on the lake and swam for hours, the lake is clean and beautiful!! We enjoyed the water crafts when the larger group were not using them. We did not have any mosquitos the weather was perfect! Think we found our family vacation rental!! We will be back summer of 2019 and possible continue to return as long as we can. Wonderful place, magical time. could not have asked for more! Thanks to the owners for sharing their "Little Secret" with us. They were extremely kind people and gave us our space, sorry we never got to meet them but maybe next time. When we needed anything all we had to do was call. In response to your comment regarding the shared watercraft, we'll be purchasing 2 additional kayaks next spring so that won't be an issue in the future. Look forward to hosting you again next year. Great place! Both cottage and lake. The only thing I didn't like was being so close to you neighbors. From what I was told, our friends enjoyed their stay at your cottage. Thanks for sharing your cottage. We recently rented Bala's Little Secret for my father and his wife while we stayed in Bala's Lakehouse Retreat next door. The cottage was perfect in every way and exactly what you would expect from a Muskoka experience. The stairs to the loft are a bit steep so if you have issues with mobility or small children this little house may not be right for you. The dock is perfect and the facilities really great. Philip great to work with and a perfect host. Great cottage - Great location - Great swimming - we had a Great time!! We rent a cottage every summer and this is by far our favourite in about 10 years! Just two of us and our dog and the cottage was perfect size for us. Would also be good for two couples or a couple with one or two children. The swimming off the dock is fantastic and there are NO WEEDS!! Just amazing swimming! There is also a gentle slope for kids/pets to wade into the water on either side of the dock. Absolutely everything we could have needed was provided, including a paddleboat and kayaks which really added to our enjoyment of the lake! The owners were available by phone if we needed them and very kind. I would Highly recommend this cottage and hope to rent it again next year! A little gem that is picture perfect for a small family! This is an absolute find for anyone looking for a small cottage in a great area! We snapped up this cottage after seeing it while renting the larger cottage next door last year. It was perfect for our son, his wife, and their 13 year old son, although it could accomodate more. They absolutely loved it! Great deck, lots of wonderful Muskoka chairs here and there to relax in and amazing sparkling water to swim and boat in! Lots of space between the two cottages, so could easily be rented on it's own. It is full of charm, with a nice sized living area with comfy chairs, a little kitchen, and an unexpectedly wonderful renovated bathroom! There is a loft bedroom upstairs that sleeps 4, accessed by a small stairway. I did see several reviews commenting on the steep stairs, but did not find them a problem myself and I am in my late 60's, so except for very small children, don't think it would be an issue. We rented both cottages last year, and can't wait to return for what my grandson who stayed here calls "the best week of the year!" Thank you for your wonderful review, looking forward to having you back in 2017.